After falling in love with my other Fallkniven knives I could not help but to spring for a couple Fallkniven SK1, SK6, and SK3 Swedish style knives from their exclusive custom line and they are stunning with the curly birch handles, brass fittings and that stunningly efficient 3G steel. Fallkniven started in 1984 focused on manufacturing the highest quality production cutlery available anywhere using current materials and manufacturing. After ten years participating in Swedish military testing of a multitude of other knife manufacturer designs, they found most would not survive the harsh cold environments the Swiss military. 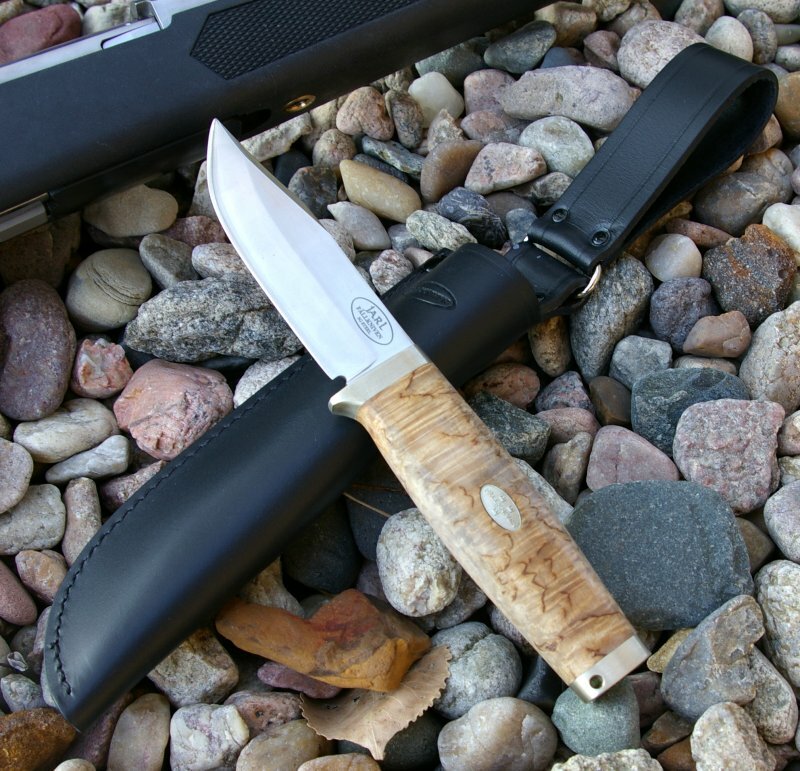 Fallkniven started back at the drawing board and developed a fundamentally different approach with the then new VG10 steel and by updating an old Japanese laminated steel Kasumi technique to produce a harder, tougher, and sharper blade. 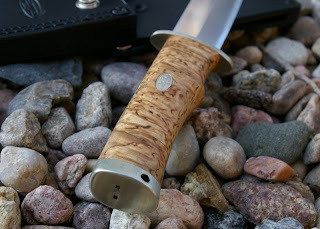 In 1995 Fallkniven began producing the now famous laminated Fallkniven F1 Survival knife for the Swedish military which many, including myself, consider to be the best light-weight survival knife ever produced. Fallkniven offers a variety of knives, sizes and options, as well as the exclusive custom line of Fallkniven SK1, SK6, and SK3 knives. Where many knife manufacturers focus on the latest and greatest trendy knife design, Fallkniven focuses on offering no-nonsense knife designs that are safe, comfortable, strong and sharp with the best steel available anywhere. The old clip and drop point designs used by them are nothing new, but they have proven to be the most useful designs through time. What makes Fallkniven really special is the steel used in their knives. Very few knife manufactures use the extremely expensive VG-10 steel for their blades outside of the kitchen knife industry, Fallkniven bested themselves when they introduced the 3G steel. This steel increases performance of the VG10 steel significantly and is from my experience the most advanced cutlery steel anywhere. Of course Fallkniven laminated this as well so we end up with a insanely strong and sharp knife with no equal. These 3G steel bladed knives will reward owners with not only beauty, but also the longest sharpest edge holding knife you can buy. 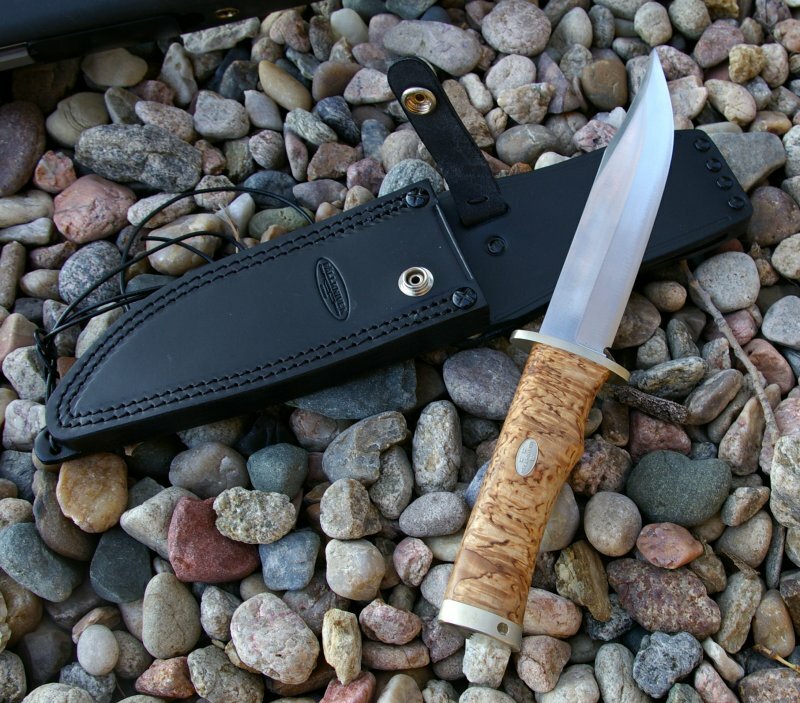 Fallkniven also contours the overall blade shape for a convex edge. This again is a very expensive process which few manufacturers offer. Most manufacturers just grind a simple edge into a slightly contoured blank. The convex edge retains more of the steel in support of the edge, which provides for a stronger finer sharper cutting edge which will be less prone to chipping than a ground edge. The smooth grind itself cuts and passes through things much more easily than a multi-angle ground blade. This expensive convex grind process nets a very strong but extremely sharp edge which is typically only found on handmade custom knives. Ohh I love the feel of a custom knife and all three of these Fallkniven knives feel perfectly balanced in the hand. Like the regular production line, the finish and & fit of the SK1, SK6, and SK3 are exceptional and the edge grind is pure convex ground perfection. You can tell additional effort was spent ensuring no detail was left unaddressed on this exclusive custom Fallkniven series. In the case of these knives the curly birch handles still provide grip when wet and blend perfectly with the nickel silver finger guard and buttcap. The leatherwork on the sheaths is also truly exceptional. Often I see just gorgeous handmade knives paired with very amateurish sheaths. 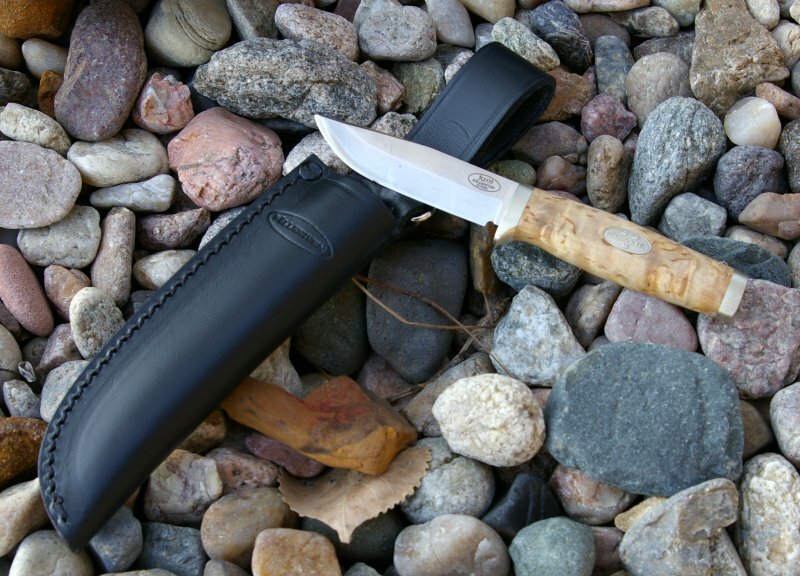 In the case of the Fallkniven knives, the quality of the sheath matches and compliments the knife itself. The only fit issue I had was the SK1’s sheath was just a tad too tight initially, however with use, it has loosened up to an appropriately snug fit. The SK6 and SK3 sheaths fit perfectly right out of the box. 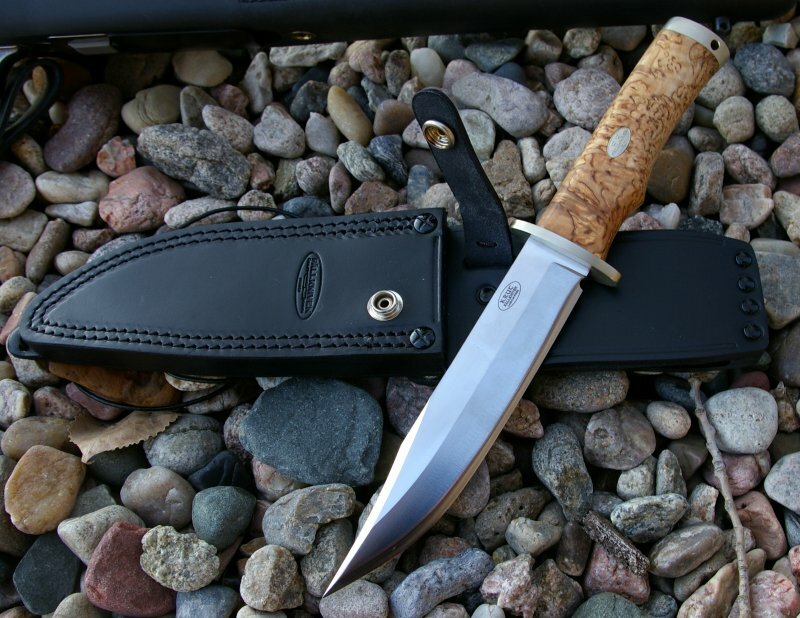 Fallkniven SK6 - The SK6 is an excellent large blade general purpose field knife with a thick 6mm blade which I would imagine could take an obscene amount of abuse. 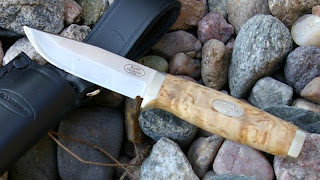 I did test this beautiful knife via a vegetable cutting test and effortlessly batoning the knife through a 3” cottonwood. Due to thickness of this blade geometry, it was not the best at the finer tasks which vegetable cutting, slicing and prep. The knife is definitely better suited for larger boning, and skinning tasks and the the full nickel silver finger guard provides good finger protection during those bigger tasks. Fallkniven SK1 - Of the three knives the SK1 has been by far my favorite and the most versatile. It passed the kitchen food prep test producing crisp kitchen cutlery cuts. The 4.5mm blade was tough enough to handle repeated batoning cuts through larger logs, but still thin enough to not create a wedge effect during fine cutting and slicing. The overall blade geometry serves many purposes well and from my perspective is the finest “survival knife” a person can own. 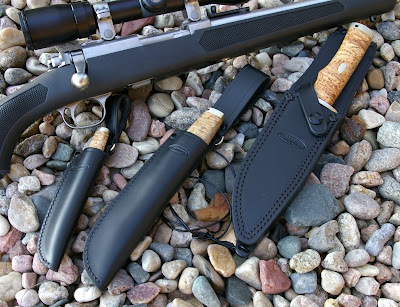 Once the sheath was broken in I really liked the open top leather sheath providing both secure carry and easy access. Fallkniven SK3 - The SK3 is probably the most interesting of the three knives due to its size. Basically the SK3 is a perfectly scaled down version 70% the size of the SK1. The blade is essentially the same size as a standard Swiss Army knife, however that 3G fixed blade delivers one durable little scalpel. I think all too often we think we “need” a giant blade, however this little knife proved big cutting power comes in little packages. I was not surprised at all that I was able to easily baton the little knife through 2” cottonwood. 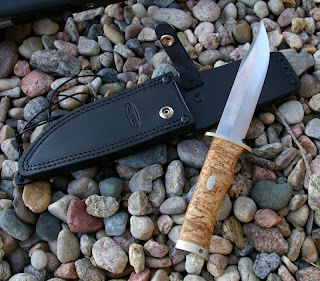 A truly fine little knife which is perfect for general bushcraft, caping, and more useful than its size would indicate on all but the largest tasks. Now the one and only downside... the price. These three knives are definitely up there in price and they should be for the quality, however consider this level of craftsmanship would set you back twice the price from a custom knife designer, which is the only place you will come close to this level of quality, these knives a very good deal for the knife lover. The blade steel alone is the best, sharpest, and longest lasted edge of any steel I have ever tested... really the Fallkniven 3G steel is spectacular. Then layer on nickel sterling finger guard, buttplate, and curly birch handle and you have a special knife. What defines a Swedish knife? Apparently it means sharps as hell, beautifully finished, utilizes the world’s finest materials, and ergonomically correct no frills design. Fallkniven would add that the Swedish knife design would not outshine the user, however I disagree, I could be covered in crap but by pulling out the SK6, SK1 or SK3, I would feel like a Million dollars. They are gorgeous to look at, handle, and perform superbly. 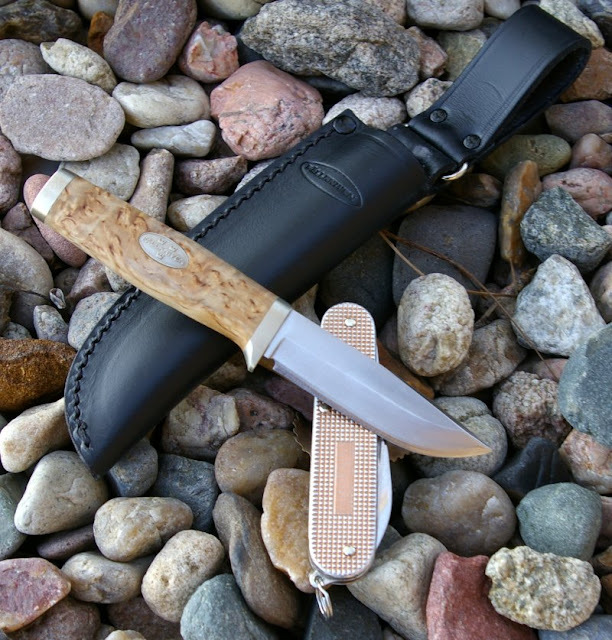 Simply put, if you want the finest production outdoor knife made, this is it.